I'm reading a book about the formative years of one of the world's great nation-states. The discussion of that nation-states's constitution and how it came to be invokes tension between states' rights and centralization, and political schemes that sought to balance the ideal of democracy with wariness of that thing called "the people." The word federalism finds its way into the discussion, and the author offers compelling portraits of the men at the heart of the country's formation. I learned who the thinkers were, who gave the most inspiring speeches, and who were the gifted administrators who held everything together. The country's most revered figure is quoted as having said he would like to see a woman from the most despised class as the new nation's first president, however, so I knew I was no longer in the United States. In other respects, though, the process and problems of constitution formation were strikingly similar in India and the U.S. 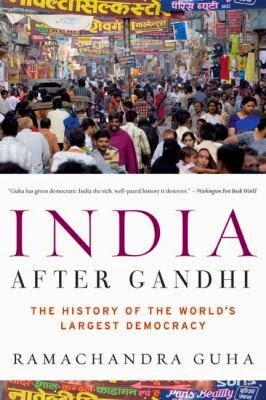 It's no wonder that the book quotes one scholar as calling India's constitution "perhaps the greatest political venture since that originated in Philadelphia in 1787" — three short blocks from where I sit as I write this post. 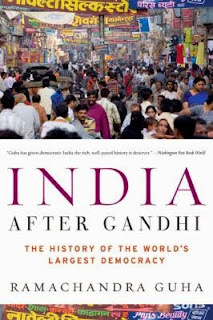 The book — India After Gandhi, by Ramachandra Guha — offers other surprises, as well (to me, at least). One that might resonate with readers today is that a leading voice against reserving seats in the Constituent Assembly for India's leading minority — Muslims — was herself a Muslim. That's right, herself. Separate electorates, said Begun Aizaz Rasul, are "a self-destructive weapon which separates the minorities from the majority for all time." I see no reason yet why anyone who admires the great-spirited secular idealism of the American founders should not admire the similar qualities and the people who advanced them in modern India. As for what eventually happens to those qualities, well, don't spoil my fun. Peter, a thoughtful review of a much acclaimed book. Ramchandra Guha is one of India's foremost historians and writers and I listen to his political debates on television regularly. I have been intending to read this book. Thanks. You may know that India is among the more romanticized of nations, at least in America, and objects or romantic fantasy can also be objects of disappointment. There is no danger of romanticism with Guha, which makes the book and the country all the more interesting. I am not surprised to learn that Ramachandra Guha appears in political debated. His style is highly accessible, and enjoyable to read. I also considered it a good sign that his introduction cited both Marc Bloch and also Tony Judt's Postwar.